TCI endorses the use of guiding principles that support the scaling of transformative change. These principles are intended to enable informed decision making about innovation and reform. They reflect theory about scaling and reflect the input of community college educators and partners who implement reforms. 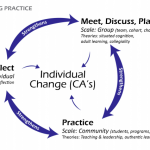 Using a principle-driven approach best positions individuals to sustain and scale reform who know the complexity of their settings and understand the diverse student populations who enroll in their programs. Guiding principles create a blueprint for scaling innovation that results in more equitable outcomes for diverse learners, including enhanced education, economic and social impact. Transformative Leadership: Scaling of transformative change will occur when leaders envision, encourage, and support innovation that supports all learners. Storytelling Brief: Scaling of transformative change will occur when storytelling is used to facilitate learning about innovation and transformative change. Capacity Building: When organizational capacity for change is strategically planned, developed, and continuously implemented, transformative change is scaled. Intentional Communications: Scaling of transformative change will occur when intentional communications are led by individuals with deep knowledge of their settings. 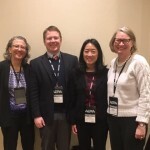 Partnerships and Networking: Scaling of transformative change will occur when individuals engage in partnerships and networking to gain access to expertise, professional development, and other vital resources. Spread and Endurance: Scaling of transformative change will occur when innovations are chosen for scaling that show the potential to spread and endure.